https://sep.yimg.com/ay/yhst-33477391359232/chili-coral-alcyonium-species-chili-sponge-strawberry-coral-encrusting-leather-coral-9.jpgChili Coral - Alcyonium species - Chili Sponge - Strawberry Coral - Encrusting Leather CoralEasyAggressiveYesIodine, Strontium, Trace elementsIndo-PacificAlcyoniidaeSmall 2" - 3"
Beautiful and manageable in size, Chili Coral is a great addition for the marine aquarium of the hobbyists of intermediate level or higher. The striking shape and colors of Chili Coral enhance the hues in your reef tank. The ensuing discussion briefs you about the various aspects of Chili Coral with respect to its maintenance in a reef-type marine aquarium. Other names: The scientific name of Chili Coral is Alcyonium species. Chili Coral is also commonly known as Chili Sponge, Strawberry Coral, Encrusting Leather Coral and Red Finger. Coral Type: Chili Coral is a Soft Coral. Origin or natural range: The Alcyonium species originates in the Indo-Pacific region of a South-East Asian country, Indonesia. Size: Chili Coral grows to a maximum of six inches in length. The growth and size of a Chili Coral varies with some factors such as, the environment around it, the depth of the water it is dwelling in and the flow of water in its vicinity, etc. Color: Chili Coral may be found in purple, yellow, orange and red colored varieties. Morphology: Chili Coral is moderately hard. The Alcyonium species has finger shaped lobes or offshoots from which extend feeding polyps that are white in color. 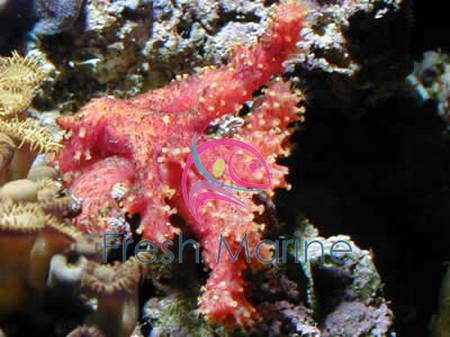 Compatibility: Chili Coral is non-aggressive as compared to the other marine aquarium invertebrates. Habit & Habitat: Chili Coral is found on the reef slopes or lagoons of the Indo-Pacific region. Water movement is strong in these areas. The Alcyonium species anchors itself to a hard surface in shady regions of reef slopes or lagoons. Chili Coral forms small colonies. The Alcyonium species is nocturnal in its habit and spreads its polyps at night. Temperature: The temperature of water having Chili Coral must be maintained within the range of seventy-two to seventy-eight degrees Fahrenheit. Specific gravity: Chili Coral prefers the specific gravity of water in a reef aquarium to stand between 1.023 and 1.025.
pH: The pH value of water in your marine aquarium should read within the range of 8.10 to 8.40. Illumination: Illumination of your marine aquarium is irrelevant in the case of Chili Coral owing to its non-photosynthetic nature. Water flow in the aquarium: Chili Coral requires medium to strong water flow in your marine aquarium. Marine aquarium habit & habitat: As Chili Coral does not grow too big in size, you can even place it in a small marine aquarium. Place the Alcyonium species at the bottom of your marine aquarium on sand. Give ample space to the Chili Coral to spread itself well. Avoid keeping the Alcyonium species with shrimps as they disturb Chili Coral and the coral closes. Chili Coral is nocturnal in habit and spreads its polyps at night. Feeding & Nutrition: Chili Coral has to be fed directly with brine shrimps, acellular marine invertebrates, meaty bits, phytoplankton and zooplankton. Chili Coral filter feeds in small quantity a few times per week when it is open. Don�t give food that is freely floating in your marine aquarium�s water. Chili Coral is non-photosynthetic in nature. Add Iodine to the water as a dietary supplement. Please ensure that your marine aquarium does not have mechanical filter as it removes the essential nutrients from the water. Chili Coral requires moderate care and is well suited for the marine aquarium hobbyists with at least six months of experience in the field. Keep Chili Coral in water hundred percent of the time. Any contact with air is detrimental to the health of the Alcyonium species.